Paint finalists! Two shades of gray. 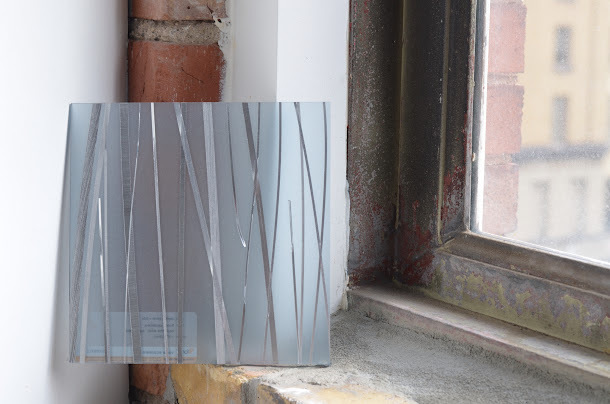 You are probably tired of hearing about our loft remodel and frankly, so am I, but since it is dominating my mind and the majority of my day, hopefully you'll bear with me until we reach the end of this project. 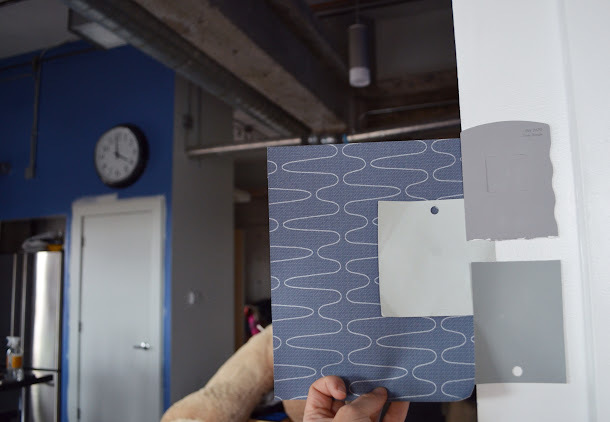 On Friday we met with our interior designer once again to finalize our 3-form movable wall material, chose an accent paint color for the dining room and living room walls, and narrow down our picks for hallway wallpaper. We also picked a bathroom sink and talked specifics on tiling the bathroom. And this whole do-it-ourselves with putting in the tile might just be a little out of our skill set. Well, out of my skill set more than Lee's, really. But fortunately that project is still weeks away. Lee has laid out a timeline for the jobs we will be doing ourselves and, just like our contractor, we are a bit behind schedule. Things like masking and prepping walls to paint, moving outlets and patching drywall, reinstalling cabinets that must be perfectly level on ridiculously un-level floors and then, oh LIFE have all interfered with keeping to that timeline. So help me pick the accent paint color! I know it's hard to tell from a picture and, believe me, Lee was practically rolling on the floor laughing as I took those paint chips on a tour of our apartment, taking photos all the while but picking paint is serious business! Originally we thought of doing something bright and crazy on those two-ish walls but, after our meeting on Friday, we decided to go with a more neutral palette and do brighter colors in furnishings and art. 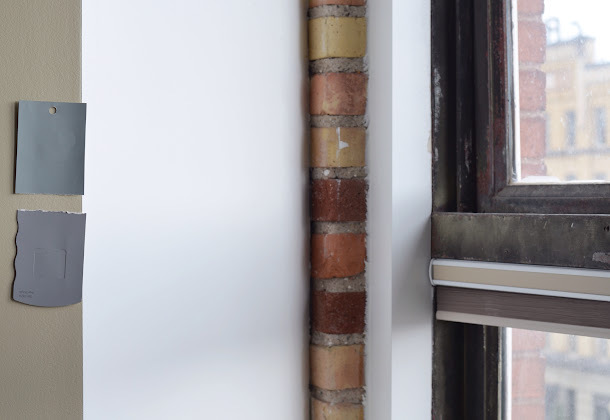 And hopefully that neutral palette will make the exposed brick in our living room the star of the show. What do you think? Cooler gray like the floor and lighter paint color in the hallway and our bedroom? Or slightly warmer gray to compliment the warm tones in the exposed brick? Or should we go in another paint color direction altogether? Sample of our 3-form movable wall! // Wallpaper finalist with the grays. And ignore the blue wall and the gigantic mess in the background! Greys are tricky. Cause they can pick up or reflect other colors. The Slate has a bit of blue and green in it. The Shingle has a little purple ish or brown color in it. 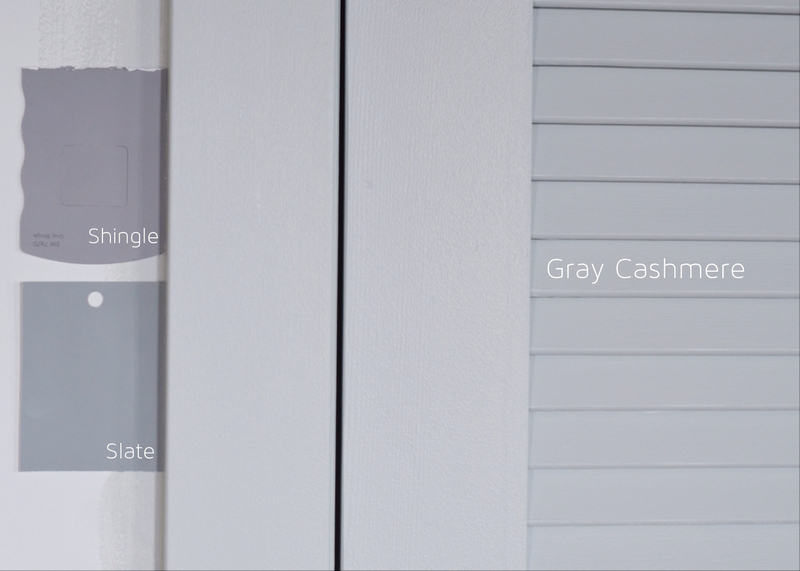 Both go well with the Grey Cashmere that you've chosen for your doors and woodwork. I think I like the Shingle best. I agree with your mom, the Slate has a lot of blue to it and I prefer a more brown undertone. I love the Grey Cashmere and the wallpaper choice! There are so many great grey paint colors- how did you narrow it down? Office poll... the ladies at the office like the color Shingle too.